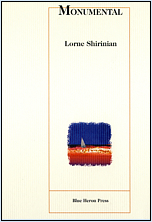 Lorne Shirinian's Monumental is a surprisingly funny and biting satire at the same time a serious meditation on genocide, remembrance, commemoration, creativity, and growth, by way of Samuel Beckett. Long one of the most perceptive and sensitive observers of diasporic Armenian life and a tireless advocate for proper recognition of the Armenian Genocide, Shirinian knows this territory well. He has managed to capture much of the pathos of the diasporan world, as the profound struggle to remember the genocide and the enormity of the loss sometimes blurs into the more mundane struggle of institutions to perpetuate their existence, while the world that was destroyed by the genocide recedes further into the past.